It's 2015, and Patricia Cowan is very old. "Confused today," read the notes clipped to the end of her bed. She forgets things she should know—what year it is, major events in the lives of her children. But she remembers things that don’t seem possible. She remembers marrying Mark and having four children. And she remembers not marrying Mark and raising three children with Bee instead. She remembers the bomb that killed President Kennedy in 1963, and she remembers Kennedy in 1964, declining to run again after the nuclear exchange that took out Miami and Kiev. Two lives, two worlds, two versions of modern history. Each with their loves and losses, their sorrows and triumphs. My Real Children is the tale of both of Patricia Cowan's lives...and of how every life means the entire world. My Real Children left me really sorry. With an intriguing and promising premise, the book really shows potential but for several reasons that I’ll explain soon, it didn’t work for me at all. I got bored, I got upset, I got disappointed. This is going to be a sulky review! My Real Children‘s story opens in a British nursing home, where a nearly 90-years-old woman called Patricia suffers from dementia. She is confused by her progressive loss of short term memory, but even more so by her clear remembrance of not one, but two lives. Indeed, somewhere in her early twenties, Patricia’s life split into two branches, each leading to a completely different life and world. I found the first chapters quite captivating and the old woman attaching and moving. So far, so good. Unfortunately, the book quickly lost my interest. It ends up being just a double biography of Patricia: the chapters alternate between the two timelines, progressing chronologically and very independently. First issue for me: the two lives are self-contained and they don’t need their counterpart. They never cast new light or trigger reflections on each other. It’s really two separate plots, taking place in different parts of the world with different characters. But what was worse was that each timeline fell into an extreme and I couldn’t really believe in them: in one timeline, Patricia is a submissive wife married to a cold and abusive man who only comes to her (with a bottle of wine) to procreate, as he insists to have more children despite her multiple miscarriages and her doctor’s recommendations to avoid new pregnancies. In the other one, she is happily united to another woman, conceives several children in the most astonishing (stupid?) way considering one of them is a biologist and should know better, and leads a life clear of troubles, totally oblivious to the very misogynous and homophobic times she was born into. The world also follows the same pattern, from socialism glory in one timeline to nuclear armageddon in the other. I felt like I was constantly swung between two caricatures. Also, the second part of My Real Children seemed really rushed. Two lives are packed within 310 pages so obviously there are a lot of ellipses, but sometimes it felt almost like a telegraph-style sum-up of Patricia’s lives. People come and go, babies are born, people die; all in a flash. For instance, in two occurrences an important character gets sick and then the narration flatly states “it took him/her X months to die”. There’s no stopping to describe people’s pain and mourning. Everything goes on at light speed. Finally, I was extremely disappointed by the alternate history aspect of My Real Children. The ending of the book is okay in the sense that it does provide some closure, but it won’t provide an explanation for the sudden branching in Beatrice life or the drastic differences between the two resulting worlds. It does mention once the butterfly effect but it feels like a lazy trick considering the author didn’t hint any causality whatsoever between Patricia’s choices and bigger events in the world during the rest of the book. In the end, I was left with regret. I did like the idea behind My Real Children and I think the narration could have been much better. Maybe it was too long: in the end the detailed account of the two lives of Patricia felt like unnecessary filling. Maybe it would have made a beautiful, moving short story. But as a 310-page novel, it was far-fetched, boring and unsatisfying. I went to see Jo Walton for the release of this book because I loved “Among Others” so much. It is still sitting on my pile. I hope that I enjoy it more than you did. I was a bit worried about the condensing of two entire lifetimes. Thanks for the review! 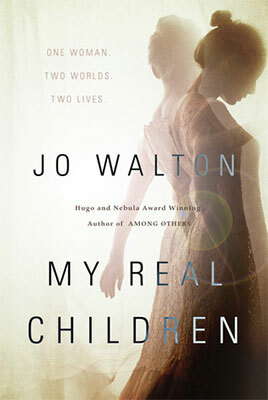 The idea and the writing behind “My Real Children” was good enough that I’m curious to read another book by Jo Walton, maybe “Among Others” since it got so many awards. But I wouldn’t advice this one as a first read of her works… it was indeed very frustrating.